યોગેશ ભાઈ — તમને પણ દીપાવલીની ખૂબ ખૂબ શુભેચ્છાઓ…!! It is greatly appreciated that you have this unique way of expressing poetry in modern format. 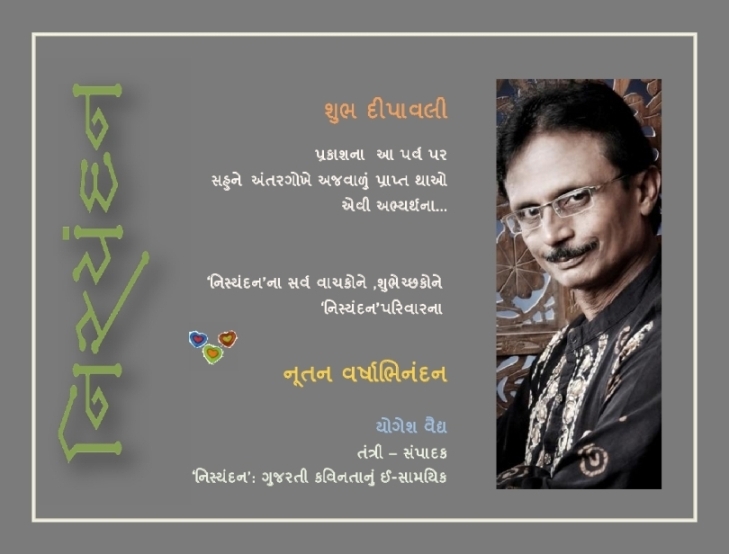 I hope you can expand its contents by writing old as well as new poetry not only in Gujarati but also in English and Hindi/Urdu especially every issue to have memorable film/nonfilm songs. We have been trying to reach more and more readers. Sty connected with this little initiative and help us in spreading readership. joshi dipak on Nisyandan’s 21-22nd Issue with a new look and layout is on your screen now..
ashwini on A beginning of building bridge..
Yogesh Vaidya on A beginning of building bridge..
કવિતાનો માણસ - ચીતરો નિશાળિયાઓ પાટી ભરીને પુષ્પો; ઈશ્વરની આ નિશળે ભણતર પતંગિયાં છે.